Well that’s what we were wondering too! This curiosity lead us to do some research to explore this fascinating topic. 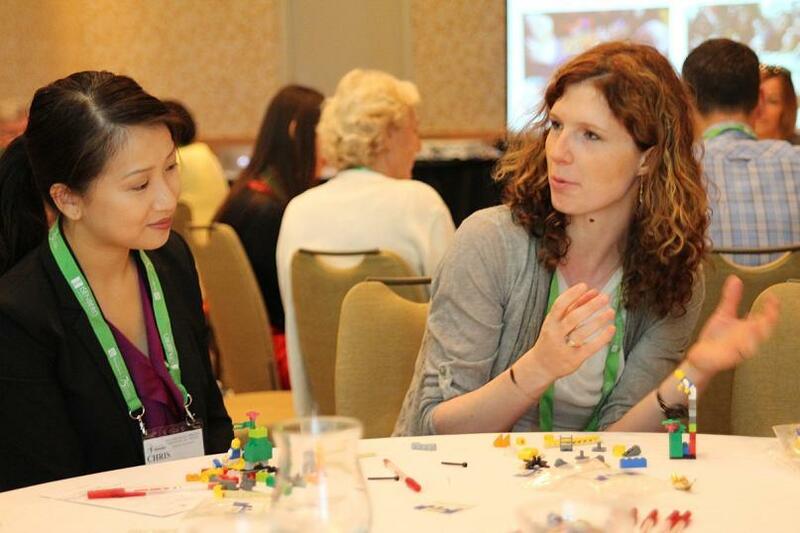 From our workshops with various groups we could see when we used LEGO® SERIOUS PLAY® (LSP) people became more open and friendly even toward complete strangers. So after a literature review, we found evidence of how creativity and play can improve trust and lead to trusting behaviors like taking risks, which are needed for innovation. 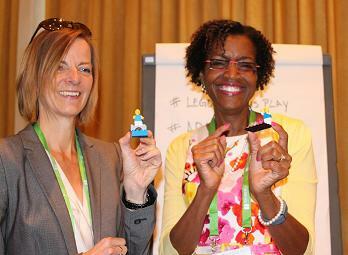 On August 7, 2015, two members of the Strategic Play® team (Dr. Margaret Rudolf and Jacqueline Lloyd Smith, MA, MBA) presented their research and practice in Vancouver at the Academy of Management. Their presentation focused specifically on the topic of creativity and trust using playful methods. Approximately 13,000 participants attended the conference. 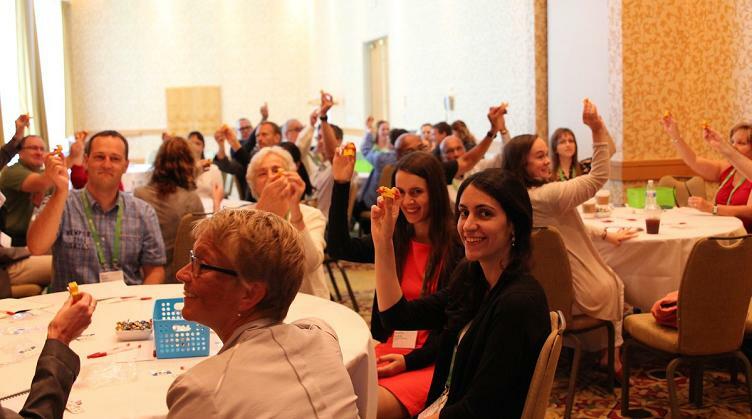 Of these, 45 lucky people (approximately 50% academics and 50% practitioners), attended a breakout to hear, see, and experience the work that the Strategic Play team are doing with LEGO® SERIOUS PLAY® materials and methodology, in organizations around the world. Trust is the fabric of all relationships. Yet building trusting relationships, or repairing ones where the trust has been destroyed, can be extremely challenging. Margaret’s dissertation is on trust and Jacquie’s master’s thesis (MACAM) is on workplace conflict. So when we add the powerful LEGO® SERIOUS PLAY® methodology to the mix, we can see in 3D how something as simple as building with LEGO® bricks can have a profound impact on group dynamics and interpersonal relationships. Experiences regarding our culture, family & country of origin, were built to create meaningful artifacts about trust. 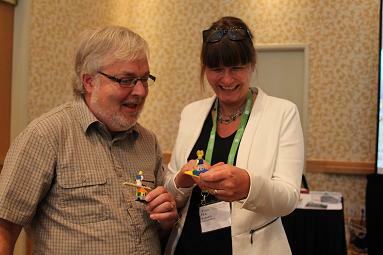 Attendees shared personal stories using 3D LEGO® models to illustrate how the power of the LEGO® SERIOUS PLAY® methodology works. This was an interactive, hands-on session where people experienced the process and then debriefed the science in real time. We created short interactions to allow for deep conversations and learning. To read more about the research, please download the PDF handout loaded with the speaking points and academic references. Dr. Rosa Nelly Trevinyo-Rodríguez‎, the Academy of Management's Chair of the Management Consulting (MC) Division, expressed her pleasure ‎with the dynamics and methodology of the workshop we presented. She said, "You definitely engaged the participants!" We are very appreciative to Dr. Trevinyo-Rodriguez and the Academy for "trusting us" to be a part of this important conference. We were also very happy to hear Dr. Trevinyo-Rodriguez add that she'll make sure to report these good outcomes at the MC Board Meetings. To learn more about our direct work with clients, make sure you look at the most recent case study with the Harvest Group, a charity working on the North Shore of Vancouver. The Harvest Group have kindly not only shared their case, but have also allowed us to share their story via video. Watch and hear for yourself! Harvest Project (you will now be re-directed to the StrategicPlay.ca consulting site).